Do Europe's police need more firepower? PARIS -- One was a young policewoman, unarmed on the outskirts of Paris and felled by an assault rifle. Her partner, also without weapons, could do nothing to stop the gunman. Another was a first responder with a side arm, rushing to the Charlie Hebdo offices where a pair of masked men with high-powered weapons had opened fire on an editorial meeting. Among their primary targets: the armed police bodyguard inside the room. With the deaths of the three French officers during three days of terror in the Paris region and the suggestion of a plot in Belgium to kill police, European law enforcement agencies are rethinking how -- and how many -- police should be armed. Scotland Yard said Sunday it was increasing the deployment of officers allowed to carry firearms in Britain, where many cling to the image of the unarmed "bobby." In Belgium, where officials say a terror network was plotting to attack police, officers are again permitted to take their service weapons home. An image from video posted online shows masked gunmen, later identified as Said and Cherif Kouachi, just before one of them shoots a Paris police officer at close range, following an attack on the office of weekly newspaper Charlie Hebdo, Jan. 7, 2015, in Paris, France. "But he did not come with the backup he needed, and the psychology to face a paramilitary assault," Thooris said. "We were not prepared in terms of equipment or mind-set for this kind of operation." "We don't want necessarily the arms that American police have. We need weapons that can respond," said Philippe Capon of French police union UNSA. Among those weapons, he added, are modernized criminal databases, because the current databases are out of date, and firewalled between different law enforcement branches. "The databases are not interactive. They are not accessible to all. They are not up to date," he said. Unlike their British counterparts, French national police are armed although their municipal counterparts tend to be weaponless. But Thooris said they are not permitted to have their service weapons while off duty, raising the possibility that they could be targeted when vulnerable or unable to help if they stumble across crime afterhours. Because of increasing unease and last week's anti-terror raids, police in Belgium are again allowed to carry weapons home rather than put their handguns and munition in specialized lockers. "The conditions we have now are clearly exceptional," said Fons Bastiaenssens, a police spokesman in Antwerp, where there are many potential targets, especially in the Jewish quarter. In addition, firearms suddenly became far more visible, with some police carrying heavier weaponry as they guard sensitive buildings and police offices, and paratroopers in the streets of the major cities. In Britain, the overall threat level is "severe" - meaning intelligence and police officials have evidence that a terrorist attack is highly likely. 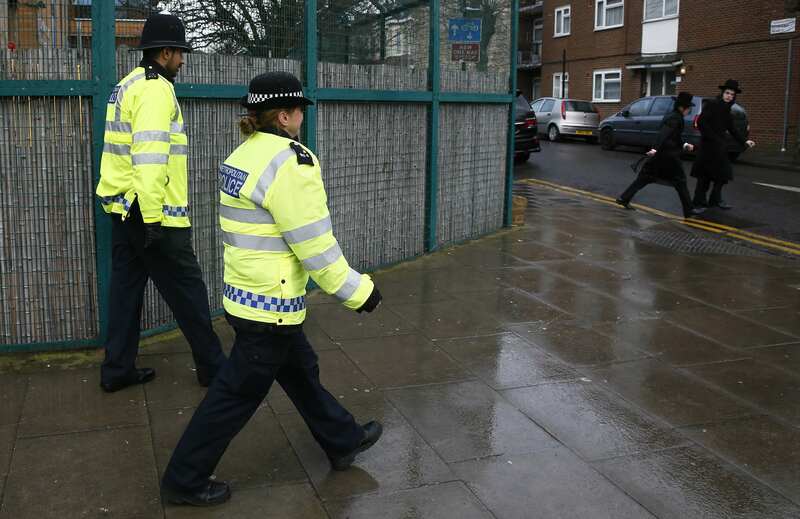 The threat to police officers themselves is judged to be very high after the Paris attacks as well as the recent disruption of a reported Islamic extremist plot to attack individual police officers in west London. In response, the Metropolitan Police said Sunday it is bolstering the deployment of specialist firearms officers who are authorized to carry weapons. The force, also known as Scotland Yard, declined to provide details, and senior police officials say there is no need for a wholesale policy shift that would arm all police. But Mark Rowley, chief of the counter-terror operation, said the "overall security posture" of the police is being reviewed in light of the Paris attacks. In Norway, where far-right fanatic Anders Behring Breivik killed 69 people in a shooting spree at a political youth camp and eight others by bombing a government office, police are increasingly agitating for weapons. "We have seen from the declarations of Coulibaly and also from what happened in Belgium that police can be primary targets for terrorist groups," said Nicolas Comte, of the SGP police union in France. "We have to give the means to police services, and notably intelligence, to fight this new form of terrorism."